Having said that, even with signal I have I am getting 24Mbits of speed down, and 2.5Mb up, however my combination of wireless router and "3" 3G+ USB dongle doesn't seem that reliable, and I have to restart it now and again - I'm not sure what the problem is. I will investigate. I have just bought a router with a built-in 4G mobile modem, which seems to be working fine, however I've been having problems with the EE 4G SIM I bought to test it with (this is a problem with EE's website and service, not the signal)... I'll update here as soon as I know if it is more reliable than the USB dongle. It seems to be faster doing uploads. There are reports that Vodafone isn't providing a useable signal for phone calls. Complaints have been made about this, it is unclear if they will fix this. The new mobile phone tower appears to be live and working. I say appears, as I'm not getting 5 bars of signal indoors (about 1.2km away), but I am getting 1-3 bars of 3G signal (on 3), however I used to get zero! Walking down to the Stour to get line-of-sight to the tower, I got the full five bars, so it is likely the issue is buildings and trees in the way rather than distance. Or possibly the antenna are not pointing my way. Possibly this level of signal is what we should expect, or possibly they are just trialling the tower. One is that it is quite expensive per GB. The other is that, although you can get unlimited data allowance plans for phones, if you hook up anything else to use the data (e.g. laptop, TV, games console), then the package is no longer unlimited, then it is limited to a maximum number of GB per month (between 1-25GB depending on the plan) and if you try to pretend you are just using your phone then they remove you from the network. So if you are just web browsing, then this is potentially a faster alternative to the fixed line. But don't expect to be watching HD TV shows, streaming music, or updating your games console with the service (i.e. keep kids off it!). Currently even with our slow internet the family manages to rack up around 40GB per month - way over the biggest plan. I will be trialling plugging a mobile dongle into my main wifi router in the next week, I'll update here as to how it goes. 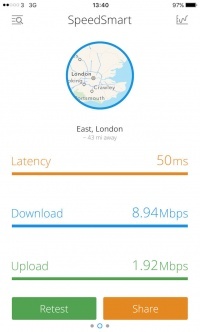 An O2 user only got 3 bars in the same location, and only 2G connectivity, on an iPhone 4s (which has no 4G - but possibly his SIM doesn't support 3G either). 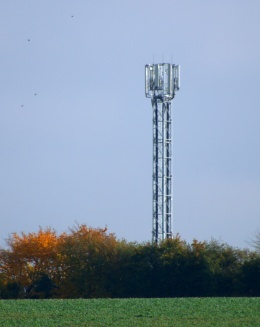 The new mobile phone tower at Cocksedge Farm was erected on the 15th June 2015. Since then the electricity supply to the tower has now been installed, and it is ready for the individual operators (Vodafone, O2, EE, and 3) to install their equipment (including transmitters) on the mast. The parish council has asked for dates for each of these from the company that installed the mast and is awaiting the reply. However, past experience suggests that this may take up to a maximum of a month to complete. Below is a photograph taken on the 21st June 2015 showing the tower lit at sunset with a darkening sky behind it. In this photo it appears that the transmitters are not yet in place on the mast. This tower is purely for supplying mobile phone coverage to Carlton and the surrounding roads (see the map below), and the coverage does not extend much further. The tower is so tall as it needs to be able to "see" into the valleys around the hill (such as down Acre Road and Brinkley Road) and it also needs to be able to "see" the nearest connected base station to be able to forward the phone calls to, which is on the water tower at Dullingham. 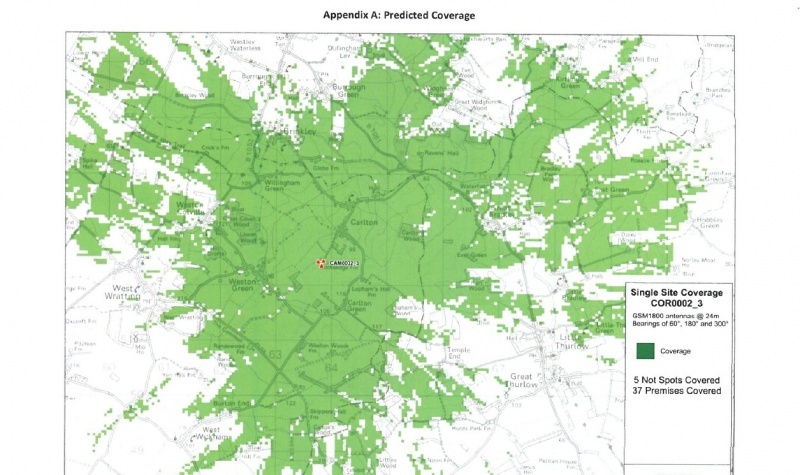 So all our phone calls and data requests will come via Dullingham! This page was last modified on 27 December 2015, at 12:50.